Most of us tire of our cars, and long for a brand new and sparkly one every couple of years. But for most, this just isn’t financially viable. Instead, how about giving your used motor a spruce up and a new lease of life before giving up on it? An obvious suggestion, but a goodie. Don’t just give it a quick clean out though, set aside a good few hours to thoroughly clean every part of the car. Shampoo and hoover all the upholstery, use an anti-bacterial wash on the interior and clean and wax the exterior. Make sure you get the hoover in between the seats and remove everything wherever possible. It is possible to update even an older car’s electronic system, to keep up with the newer models. If you drive a lot and like listening to music, consider installing a new music system, or Bluetooth device that links to your phone. GPS satnavs have also become a lot more cost effective now, and make trips much easier. New alloys and tyres can really improve the appearance of your used car. Look at purchasing some new and shiny alloys to update the vehicle, and new tyres will improve the performance and safety of your drive. 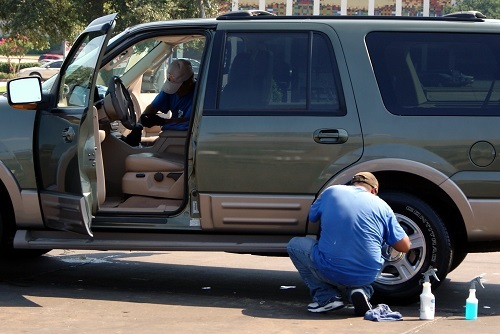 Scratches and scuffs ruin the paintwork of a car, and can make it look old and shabby. Try a DIY paint job pack from your local car store, and patch up any damage to the paintwork. Make sure you get the correct colour though, and follow the instructions on the pack. New wipers will make your car feel and look a lot newer. They’ll keep the windows clearer and cleaner, and make visibility a lot better while driving. These are a very cheap and easy way of updating your used motor.